This Kay guitar is a triple pick-up, semi-hollow body. It's commonly referred to as a Speed Demon but that may not be the actual model name. The Kay model number is K573. Kay produced these guitars for a variety of companies (see notes below for the history) but it could be a Silvertone or Kay branded model since there's no logo on the headstock. Honestly, I believe it to be a Kay branded guitar because of the engraving on the pick guard but the logo has been removed from the headstock. So it's possible it's a Truetone or Silvertone model. The guitar is 100% original; no parts have been changed. The neck is straight and all the electronics work properly (See Note below). It has a four-way selector switch that allows you to choose between any of the individual picks or all three. There's individual tone and volume controls for each pick-up. The tuning keys are Kluson Deluxe's. It was recently set up with the action nice and fast. I had several professional musician friends try it out recently and they all love it. It's plays well acoustically as well as plugged in. It has a really nice feel. It'll give you the blues, rock, or anything else you can come up with using all the variations of tone. This electric guitar is in very good condition. The only real flaw is the wear or sanding down of the finish around the f-hole but there is the usual crazing and buckle nicks. So I'd say this is more of a player's guitars versus collectors. The dimensions of this guitar are: 41" total length, 18" fretboard, and neck entire length is 26". Kay guitars (of Chicago Illinois) were first built in 1890 under the company name Groehsl which by 1921 had changed to Stromberg-Voisinet. The driving force at that company was Henry Kay Kuhrmeyer, the treasurer. He established the company as one of the main jobbers of the 1920's supplying guitars to Montgomery Wards and Regal stores. In early 1931 a higher end line of guitars was created called "Kay Kraft" and by the end of the year the company was renamed Kay Musical Instruments. Kay was sold in 1955 to one of the managers at Harmony (along with other investors) who established it as one of the largest guitar manufacturers of the time. Kay supplied guitars to Sears under the "Silvertone" line, Speigal under the "Old Kraftsman" name, Western Auto's "Truetone" brand, St. Louis Music: a large instrument distributor had the "Custom Kraft" line, and Montgomery Wards with the "Airline" brand. 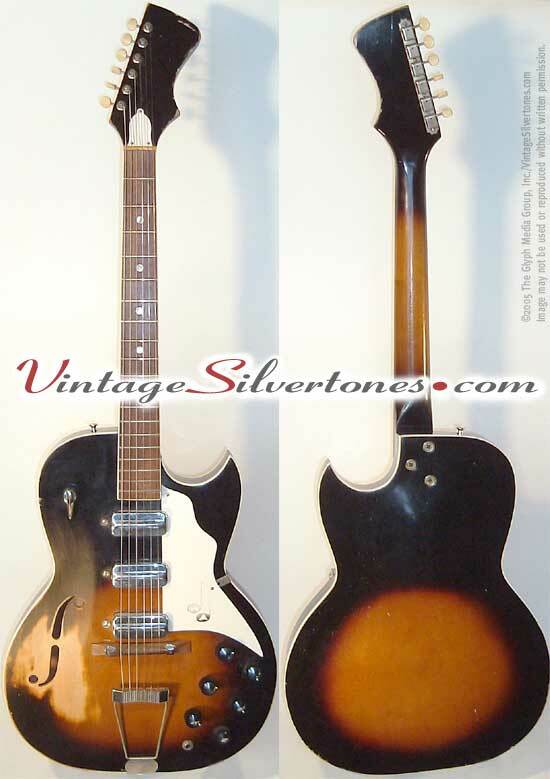 Kay supplied Sears with the Silvertone "Jimmy Reed Thin Twin" (Kay model: K-161 $350 retail at the time), the triple pick-up guitar here was also a Silvertone branded guitar, as were many other guitars. By 1963 Kay had grown faster than the market could bear, especially with the influx in the US market of Japanese made guitars (Teisco, Univox, Aria, etc.) and thus became financially insolvent. It was sold to Seeburg (the juke box company) in 1965 and then to Valco in 1967 but by 1968 the debt-load took it down and both Kay and Valco went out of business. The Kay brand name was acquired by Teisco's (owned by Kawai--who purchased it in 1967) importer Sid Weiss's WMI company in 1969 and continues to make guitars today. If you see late 1960's/early 1970's Kays you'll notice many similarities to the Teisco's of the time. They used the remainder of the inventory to create hybrid Kay-Teiscos before reworking the line and selling all Teisco/Kawai guitars under the Kay brand in 1972. ***NOTE: This guitar has a wiring problem with the middle pickup. So sometimes it works just fine and other times it cuts out. It seems to happen randomly. The pickup definitely works because I had it rewound thinking that was the issue. But it's really just the old wiring causing the problem. When the problem kicks in both the neck and bridge pickup work fine. But they will not work in the fourth position which puts all three pickups on at the same time. Because of this issue I'll accept any reasonable offer for it.